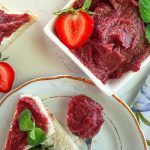 A simple sugar free fruit butter spread. Only four ingredients using your own favorite berry combination. Combine all ingredients in a heavy saucepan. Bring to a boil then reduce to a simmer for 20 minutes or until the dates are softened. Remove pan from the heat and use an immersion blender to puree the mixture. Alternatively you can use a blender, be careful with the hot liquid! Return the pan to low heat and cook the mixture until thickened. Depending on berries, 20-45 minutes.